Government’s Look North Policy and the Rice Revitalisation Programme are bearing fruits. They helped bring back Mohammad Zunnun Khalid, 37, and his family from Australia. Mr Khalid sacrificed his Australian dream to become a fulltime rice farmer at Taganikula in Wainikoro, Labasa – his birthplace. He has leased 65 hectares of land at Taganikula to invest in rice farming. He said rice production has potential in Fiji. 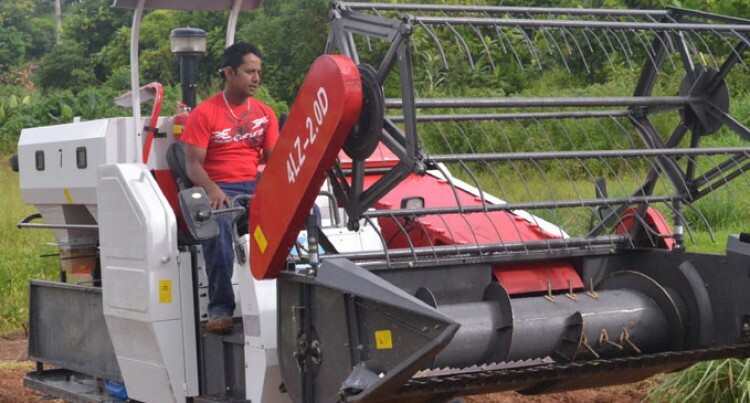 “That is why I moved to Fiji in 2013 with machines from Australia for land preparation and drainage works,” Mr Khalid said. He also brought a swamp dozer to clear and level fields to plant rice. Mr Khalid said he planted 6.4 hectares of rice and last year. The production was 10 tonnes. “The rice was planted towards the end of the season hence the production was not very good,” Mr Khalid said. He said through the Rice Revitalisation Programme, the Ministry of Agriculture supplied 20 bags of Urea fertilizer for his crops. Meanwhile Mr Khalid has planted 40 hectares of rice. So far Mr Khalid has supplied 7 tonnes of rice paddy to Rewa Rice Limited. This year Government helped him buy a rice combine harvester worth $47,850. Mr Khalid intends to lease more land near his farm and other areas suitable for rice farming.